The only way hospital clinical documentation improvement (CDI) and coding staff may compliantly clarify physician documentation for the purpose of accurate coding is to query the physician. The physician query process is essential to ensure accurate quality scores and proper reimbursement. However, most CDI specialists, coders, and physicians find the query process burdensome and time consuming, resulting in missed opportunities to improve the integrity of the patient record. These missed query opportunities negatively impact reported outcomes, quality of care, and reimbursement. Fortunately, new mobile technology is changing the process for the better, incorporating a simplified query workflow that's so easy physicians say they actually enjoy answering queries. Physician well-being is becoming a major conversation throughout the industry; the New England Journal of Medicine reports more than one-half of US physicians are experiencing professional burnout. Another frequently cited cause of physician burnout is the increasing amount of time spent using EHRs. Query workflows at most hospitals fuel physician burnout. Physicians tend to be mission driven, focusing primarily on patient care and less on the business side of medicine. Answering queries is an onerous clerical task that competes with time that could be spent caring for patients. Physicians are interrupted by documentation queries throughout their day, fielding queries by e-mail, fax, and sticky notes within the chart, as well as in person in the hallways of the hospital. Queries on discharged patients force them to recall details of the case, adding stress to an already demanding day. Most often, physicians must go back to the EHR to review the patient's chart before answering a query. Additional time must be taken to update the chart and notify the CDI specialist or coder that the query was answered, including the response's location. Because of the many steps involved, physicians report spending 15 to 20 minutes addressing one query. Adding to the frustration, some physicians are under the wrong impression that queries are about increasing hospital revenue. They are unaware of a subtle but major difference: Queries help capture full and proper reimbursement the hospital deserves for services provided. Yet this old-school thinking perpetuates a distrustful and negative association with the query process, making the jobs of CDI specialists and coders more challenging. CDI specialists and coders don't enjoy harassing physicians—it's a necessary evil of the traditional query process. While they understand that physicians' first priority is patient care—not getting the bill right for the hospital—they are often frustrated by physicians' inability to answer queries quickly and having to conduct multiple follow-ups. If CFOs calculate the FTE hours spent on getting queries answered, they would find the toll on CDI and coding productivity astounding. Queries answered on time support accurate coding, which drives a number of important benefits for the hospital, physician, and patient. • population health data capture. • avoidance of risk related to noncompliant query methods. Another challenge for hospital CFOs is the absence of real-time query tracking and reporting capabilities. Queries are often tracked manually, with each query author using his or her own methodology and self-reporting into hospital coding software or Excel spreadsheets. CFOs cannot easily or definitively evaluate these data, identify opportunities for intervention, or pinpoint losses in revenue due to unanswered queries. 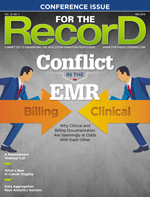 Many HIM directors say neither their coding software nor EMR system provide worthwhile reports—or any reporting at all—to manage the query process. Without automated query tracking and reporting, they cannot improve the hospital's coding accuracy or have substantiated support to bring noncompliant physicians to the attention of leadership. To successfully manage a hospital, CFOs must be on top of revenues and costs. Consider a hospital with approximately 50,000 discharges per year and a true response rate to queries of 60% (using methodology that designates a query as a "nonresponse" after a reasonable amount of time, not weeks or even months after sending to the physician). Boosting the response rate to 98% could capture another $18 million per year in reimbursement—revenue left on the table at most hospitals because physician documentation is not consistently clarified. Hospital executives are becoming more aware of the growing problem of physician burnout and are eager to address it. Physician wellness conferences and initiatives are taking shape within hospitals and health systems across the country. Finding ways to bring the "joy of medicine" back to practice has skyrocketed to the top of the priority list. When considering the administrative burden placed on physicians to manage queries, some progressive hospital networks and health systems have already identified mobile query technology as an immediate way to give back time to their physicians and ensure proper reimbursement and accurate quality measures driven by the coded data. These forward-thinking CFOs, HIM directors, and CDI managers have streamlined the query process with a cloud-based, EHR-integrated mobile solution. They have wiped out traditional, time-consuming 1980s query workflow and replaced it with innovative, physician-friendly automation that saves everyone time. For example, a large health system in Maryland has seen dramatic improvement by focusing on query workflow automation. At one of its community hospitals, CDI staff typically queried 25% of eligible beds, receiving a 40% response rate to queries placed in the EMR and a 69% response rate when they visited the physician in person. However, it often took three or four in-person visits to get a query answered—a high resource cost to the hospital. After implementing a mobile query solution with automated query tracking, notification, and reporting, the numbers improved significantly as CDI staff productivity rose to 45% of eligible beds by eliminating time spent following up with physicians. The physician response rate increased to 98%. Physicians were relieved of the steady interruptions from CDI specialists and found it satisfying to answer queries when convenient. Some physicians reported answering queries from their smartphone at the grocery store and while at their children's soccer games. More than a year later, the health system has maintained an overall 98% response rate and an average query response time under 48 hours. These data included hundreds of community physicians, many of whom never before answered a hospital query. Why was this approach to physician queries successful? Reducing the time to complete this administrative task from 20 minutes to seconds improved physician quality of life and helped the health system widely address physician burnout. One physician explained it succinctly: "The technology made it easy for us to do the right thing." Physicians generally want to help the hospital achieve its financial and quality goals. However, they need convenient, easy-to-use technology to manage their demanding work schedules and to keep patient care their first priority. Furthermore, the Maryland health system was able to demonstrate the consequences of this revenue-jeopardizing process through weekly autogenerated query reports to clinical and administrative leadership. The enhanced visibility and transparency motivated the necessary changes to make the query process successful. Today, all physicians working at this health system are aligned under a common set of query goals and expectations. The good news for hospital CFOs? They can improve this process quickly and track the results. A cloud-based, mobile query solution can be implemented within two to three months, which means hospitals can immediately capture revenue lost due to missed query opportunities and eliminate the high resource costs associated with inefficient workflows. In an era where mobile technology is adding conveniences to our everyday lives, it makes sense for hospitals to adopt solutions that do the same for their extraordinarily hard-working physicians. — Marisa MacClary is cofounder and CEO of Artifact Health. Great Valley Publishing Co., Inc.